The Department of Social and Behavioural Research is an integral part of the NIRT. Their roles are diverse from being supportive in all the clinical trials conducted in the centre as well as focussing on crucial social behavioural studies in TB and HIV. 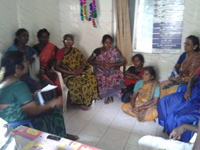 They have conducted many cross cutting sociobehavioral studies which have policy implications. These include descriptive, cross sectional, qualitative, feasibility studies and intervention studies using the RCT model to test the effectiveness of psychosocial interventions on various target groups. Findings from their studies are disseminated to stake holders and policy makers and through national and international peer reviewed journals. The team also takes keen interest in IEC activities and have developed audiovisual aids such as films, posters, flip charts, modules which are used in all their community awareness activities and training programmes. Their training has covered NSS programme officers, teachers and students from various colleges and schools. They also play a crucial role in counselling of TB patients and families, psychosocial support individual and group sessions and have been successful in rehabilitating TB and HIV patients and their families.